The first time I saw Alfred Hitchcock's The Birds I was a teenager, and I saw it at the rep cinema, on a big screen. It terrified me. I remember the crows from when I was little. An old neighbourhood — century-old homes — downtown. From our front porch, we could see the length of Woodland, which ran perpendicular to our street. And the agèd trees were shrouded in black, so the street bore a thick feather canopy absorbing any remaining daylight before it could reach the ground below. Thousands of them, cawing their hoarse insults and threats at us. Some years were worse than others. The rook, supreme creature that he is, can find all the food he needs in a couple of hours a day and consider the rest of his time leisure. What does the rook do with this leisure time? 1. He tells jokes and gossips. 2. He engineers handy, throwaway tools. 3. He learns to speak foreign languages. 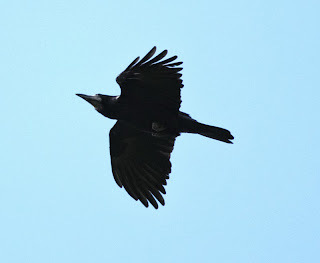 The rook can imitate the human voice, a logger's crane, the crash of broken glass. And if he wants to really make fun, he can call your dog to him — with your own whistle. 4. He enjoys poetry and philosophy. 5. He is an expert on rook history. 6. He knows more geology than you do — but since it is knowledge passed down through the generations from his ancestors he calls it family anecdote. 7. He has a good grounding in mythology, magic, and witchcraft. 8. He has a keen passion for ritual. In essence the benefits of having the key to world's larder are that rooks have the time to think, the brain power to remember — and the wisdom to laugh. — from Bellman & Black, by Diane Setterfield. I am loving Diane Setterfield's new novel and stayed up way past my bedtime to read it last night, but fell asleep before I could finish. There are crows in this book, or ravens or rooks. Also, there are some interludes — avian facts and anecdotes. I cannot tell the difference between these birds, but I spent much of the weekend reading up. Setterfield also informs us of many of the collective nouns used for these birds, and I have discovered several others. A murder of crows, a hover, a muster, a parcel, a storytelling. An unkindness of ravens, an aerie, a conspiracy. A parliament of rooks, a building, a clamour, a congregation, a parish, a shoal or a wing.